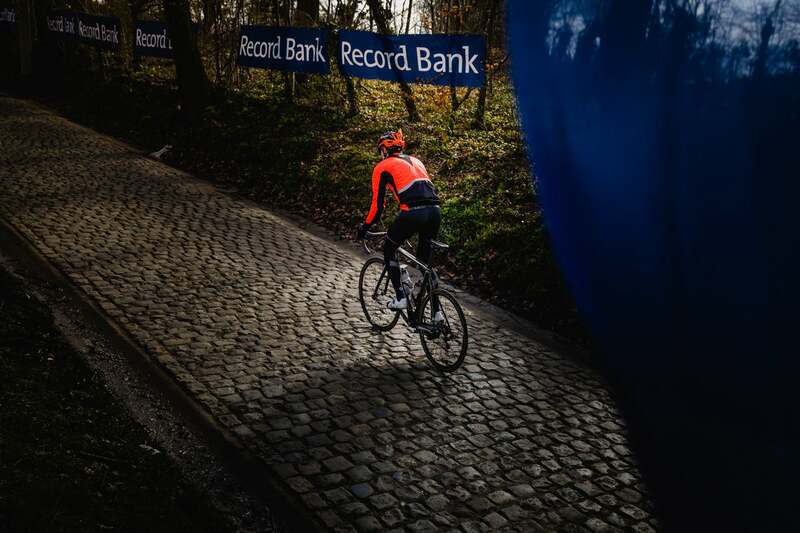 These Stones… Three cyclists experience the sacred cobbles of Belgium. Although I’ve lived in France for five years—and I was even a foreign-exchange student in Roubaix, of all places, when I was in high school—I’d never been just next door to ride in Belgium, let alone ride the epic cobbles and climbs of Flanders. I’ve seen all the dramatic photos and videos of man and machine tumbling through the narrow country paths in the wind and rain; but I’d really only known Belgium as a quiet flatland where the people love beer, cycling and anything fried—all at once if possible! Luckily no one asked me to climb the Oude Kwaremont in a rainstorm, or grimace my way up the Koppenberg only to find that I still had a string of cobblestones and climbs to numb my nerves and shake my bones. Luckily, someone did ask me to go to Belgium, but to shoot other people doing this to themselves on these dramatic roads. So my friend William and I packed up the truck early one spring morning and drove to meet our new friend Wendy at her bicycle bar, the Peloton de Paris, in Mechelen, midway between Brussels and Antwerp. Already, the sky was narrowing, grumbling, as if our very arrival beckoned the gods of the stones to bring us the best (or worst!) that Flanders could dish out. Our evening began with a test ride on some of the local cobbles, straight away producing a broken front skewer and a loose bottom bracket. We packed up the car again and drove to the bar because Wendy’s husband Vincent, born and raised riding in Flanders, is a stellar mechanic. Surely he could help get the bikes set for the region’s punishing roads. Wendy greeted us with a steaming cappuccino while Vincent set to work on William’s bike. We got out our beautiful kits from Assos and admired the handsome bicycles in Wendy’s shop: Ritte, Ridley, Merckx…. We were also treated to an array of cycling beers I’d never seen before, including Kwaremont, Lille and Molteni—yes, there is a Molteni beer, featuring all of Eddy Merckx’s racing jerseys. I’m a collector, so I bought a set. My Assos Spider backpack, although designed for photographers, also nicely fits four bottles of beer! We parted ways and went to our respective hotels close to the route of our Flanders ride. And then it struck. At 3 a.m., the crashing of thunder and driving rain woke me up. I knocked on William’s door and we debated the plans for the 107-kilometer ride in the morning. Could we still do it? Was it crazy or epic of us to try if the conditions were wet and slick? These Stones… Easter with the Boys. These Stones… The Stones of Flanders.